Over the past few months, I’ve gotten rather picky about newer historicals. I’m not immune to a good romp through drawing rooms and gaming hells, but there usually has to be some distinguishing factor like a really broken hero (see last Thursday’s post) or a bluestocking heroine. Even writers who are doing Very Different Things seem to me to be doing Very Different Things for the sole sake of being different. The plots and characters are intriguing, but the emotions fall flat. I mean, go ahead and make your point, but you also have to make me fall in love. As a result, I’ve been delving into backlists to find older historicals, often by writers who aren’t writing any more, or aren’t writing romance. Patricia Gaffney is one of those writers. This interview with her at Dear Author from 2011 gives great background on her books and career progression so I don’t need to repeat all that here. Wild at Heart was written as a response to Alice Hoffman’s Second Nature. Gaffney didn’t like that it didn’t have a happy ending so she wrote her own version. The fact that I never read Second Nature didn’t dim my enjoyment of Wild at Heart. Probably mostly because I’m a sucker for a hero who can’t communicate. Not because he’s an emotional nitwit, but because he has literally forgotten how to speak. The book is set in a suburb of Chicago in 1893, the year of the Chicago World’s Fair, already distinguishing the book from the cookie cutter pseudo-Regency, quasi-Victorians that have occupied historical romance shelves lately. From the beginning of the novel, we are given to understand that the hero was abandoned in the woods as a child and grew up around animals (yes, cliched wolves, but also bears, badgers, birds and foxes). This has given him strange mannerisms, odd food preferences and, as mentioned, a lack of will to utilize human speech. He is being studied by the heroine’s father, an anthropologist who wants to use him to to determine something about man’s inherent sinfulness. The heroine has doubts about both the efficacy and morality of this course of action and her empathy leads her to befriend him early on. Sydney is a widow whose marriage was pleasant, but not earth-shattering. She is being courted tenaciously by her father’s research assistant, but she’s finally looking for something more in a man and finds it in the wild, yet curiously attentive hero. I can’t go into too much detail about the plot of this book because the romance is inextricably woven into the fabric of discovering who the hero was before he ended up in the woods and who he’s becoming by the end of the novel. What struck me most about Wild at Heart was the degree to which it reminded me of the best science fiction and fantasy, using cultural outsiders to question things that we take for granted. In this case, there is an obvious criticism of cultural mores surrounding female sexuality, the treatment of animals and to a lesser extent, materialism. It elevates the transformative power of art and highlights the limitations of Modern, rationalistic scientific exploration. But it’s not all about the message. The relationship that blossoms between Syndey and the hero is one of love, trust and sacrifice. Also, a sexuality that has nothing to do with intellectualism or anything but the mutual indulgence in sensation. This is just a tremendous book and deserves a permanent place on the shelf of any romance lover. Wild at Heart also has a tremendous sense of humor. There is an element of ridiculousness to the idea of a young man being found in the woods and given the heaviness of some of the plot, it’s good that Gaffney spins some amusing scenes, like one where the hero has seen Sydney’s ardent admirer give her a bouquet of flowers and decides to give her a present of his own. Which turns out to be a dead whitefish. 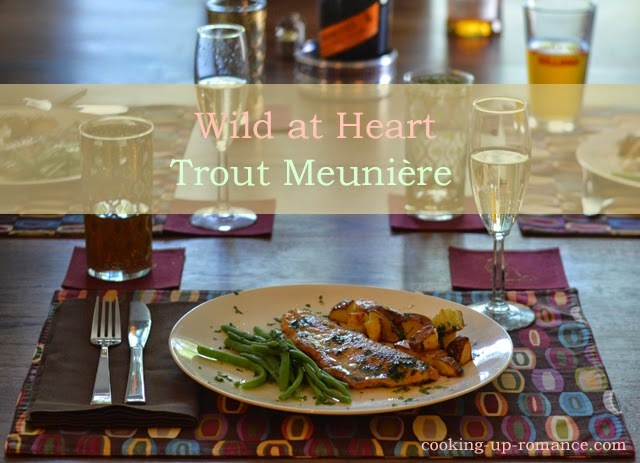 Even Sydney’s uptight, snobbish Aunt Estelle would appreciate this easy, delicious preparation of simple butterflied trout. Chicago in 1893 was trying to assert itself as the New York of the West and this cosmopolitan dish would have been perfect for its upscale hotels. 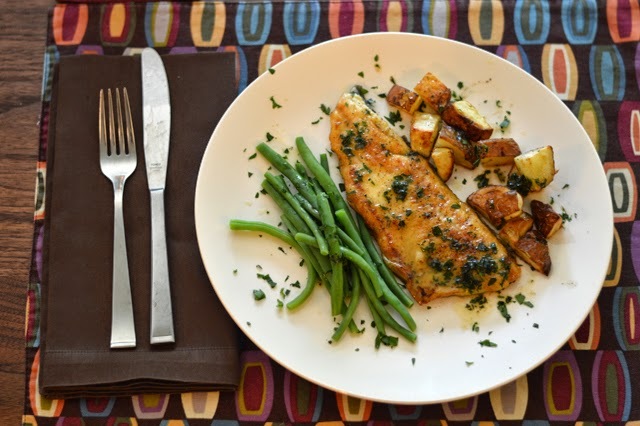 The key to this dish is to get the oil very, very hot to cook the fish and then to let the pan cool down before adding the butter to make the sauce. That means no cast iron. Just your non-stick or stainless steel is fine here. I turned on the exhaust fan and opened a window for this one since it does get a little smokey. This dish is fancy enough for company, but comes together so quickly that you might actually get to enjoy your guests! I made it for four people and didn’t even need extra flour or sauce so if you’re doubling the recipe, just buy more fish. 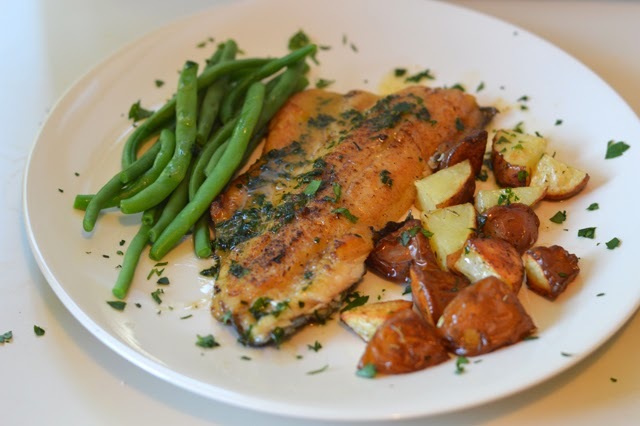 I served it with quartered new potatoes roasted in rosemary and olive oil and steamed green beans. There’s a lot of butter going on here so I’d recommend sides that aren’t too heavy. 1) Salt and pepper both sides of fish. 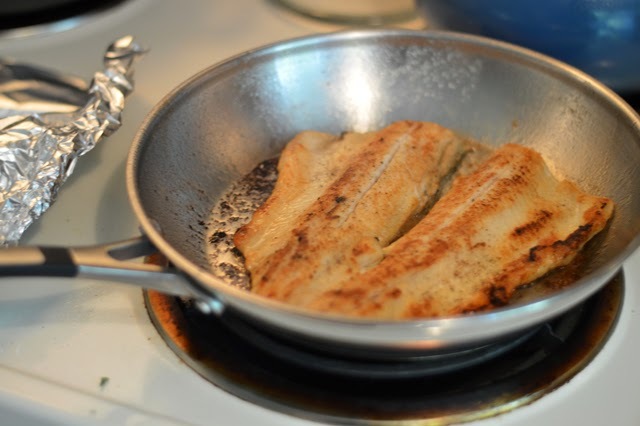 Put flour in a large shallow dish and coat fish on both sides, shaking off the excess. 2) Heat oil in a medium skillet until smoking. Add fish to skillet, skin side up, and cook for 2-3 minutes depending on thickness of filet. Flip fish and cook for 1 additional minute. 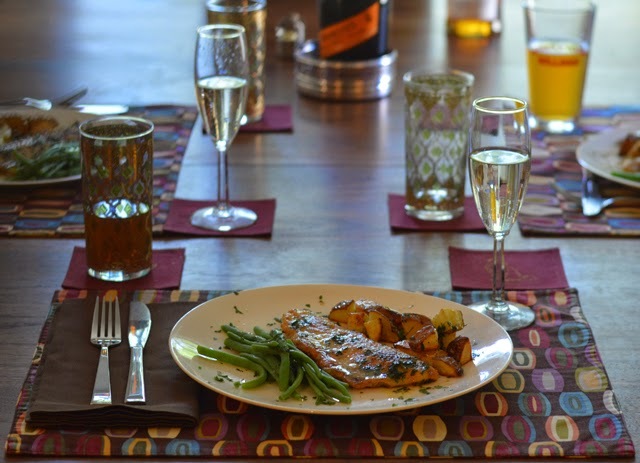 Remove fish to plate and tent with foil. 3) Let pan cool for 1 minute. Carefully wipe out hot pan with paper towels. Put butter in pan and melt. Watch it closely, allowing it to brown. It should take about 3 minutes. 4) Add the parsley and shake to coat. 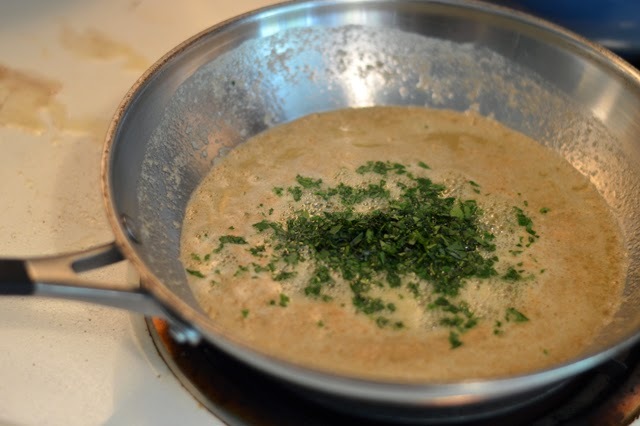 Take the skillet off the heat and add the lemon juice to keep butter from browning further. 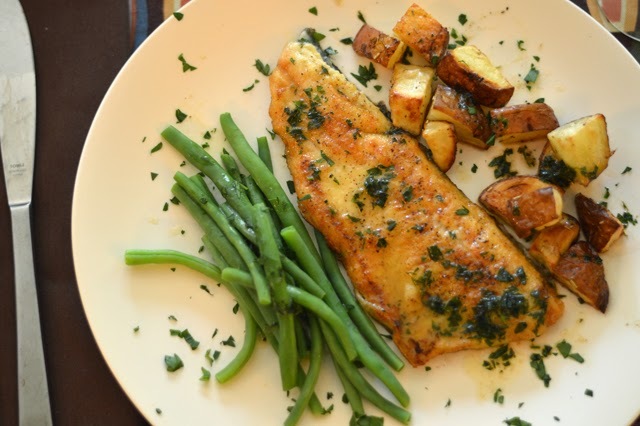 5) Pour over fish, garnish with reserved parsley and serve immediately.